Deals abound on 34th Street for Black Friday, and below is a small selection. Happy Thanksgiving and happy holiday shopping! 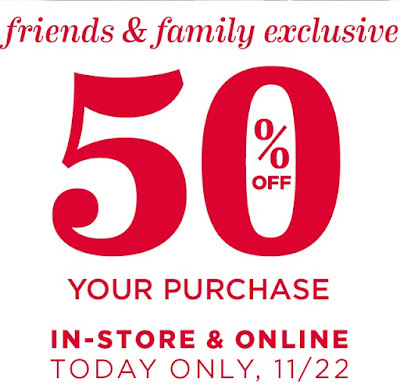 Macy's Black Friday "Walk in and Win" begins 6pm Thanksgiving evening. Along with Macy's unbeatable doorbusters and specials, customers will have the chance to win big prizes using Macy's mobile app while shopping in store. Go to http://social.macys.com for more info and to download the most recent Macy's app! 50% off everything! I like Express sweaters, tights, cute boots, and their One Eleven collection. 50% off everything! Stock up on 1969 jeans and some cozy holiday pjs. Pre-Black Friday deals are going on now with up to 60% off. Black Friday deals start at $4.99, with scratch-offs for the first 100 people worth up to $300. Doorbusters on Black Friday 6am-9am with $1, $5, and $10 deals. Take an extra 30% off sale items and enjoy select sweaters for $39, flannel for $29, and much more.